You may have already heard of SMART goals, well SMARTER goals just include 2 extra elements to ensure the goals you’re setting are personalized to you. The main benefit in using this process is that your goal gets written down – sounds a bit simplistic I know, but time after time it has been proven that people who only set goals in their mind, don’t achieve them in the end [ie new years resolutions]. The simple act of writing down your goal is so important because it takes it out of your thoughts and into your reality. The SMARTer goal process is highly effective at allowing you to set and achieve specific goals that have definable steps and actions. They are not so useful at directly achieving your long-term goals, other than for achieving the milestone goals that ultimately lead towards your big-picture. It is therefore important to keep using processes like Mind Mapping to keep sight of your big picture. 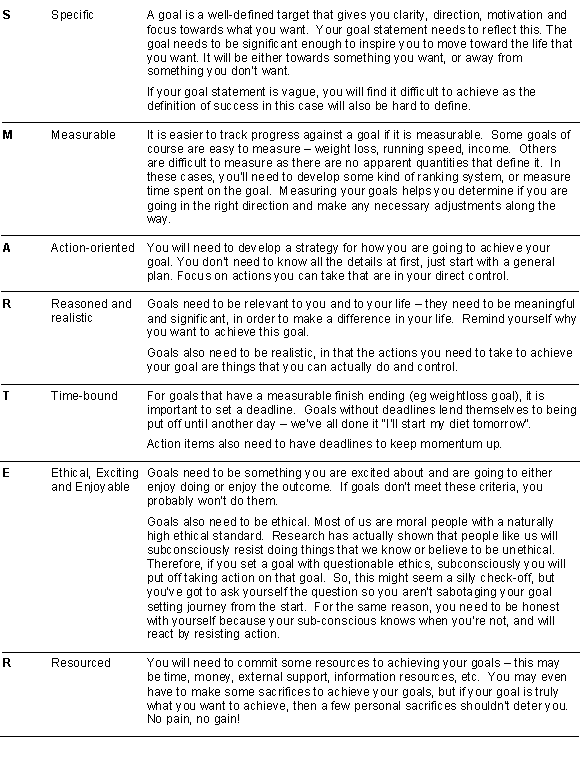 A SMART goal template is provided in the ToolBOX.